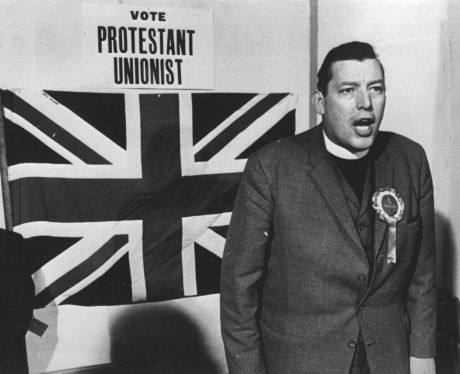 In considering the recent revelations about Mark Haddock’s UVF career at tax payer’s expense, as a killer informant for the RUC, let us not forget Ian Paisley. Last week the Historical Enquiries Team of the PSNI was forced to apologise to Eugene Reavey for the RUC whispering campaign that tried to justify the sectarian shooting of Reavey’s three brothers in January 1976 in Whitecross, south Armagh. The shootings happened the day before the Kingsmill massacre of 10 Protestant civilians on January 5 1976, in the same general area. Three members of the O’Dowd family were also shot dead by the UVF the previous day. The Reavey and O’Dowd killings happened within 30 minutes of each other. Members of the RUC and the UDR were involved in the Reavey-O’Dowd shootings. This was collusion Armagh style, where RUC men such as Billy McCaughey and John Weir went on shooting sprees with the UVF. Billy McCaughey, who was at the Reavey shooting, was also formerly a member of the B Specials and of the Paisleyite Ulster Protestant Volunteers, before joining the RUC. After Eugene Reavey collected his brother’s bodies for burial the whispering and the harassment started. The RUC accused him of being involved in the Kingsmill massacre. Eugene Reavey subsequently pointed out that one of the RUC officers making these claims, and who was investigating the killings, was also actively colluding in UVF shootings. Ian Paisley and his party like to tell us how uncomfortable they are at the prospect of sitting with terrorists in government. Terrorists and killers in the police don’t seem to bother them so much, so long as they are killing Catholics. 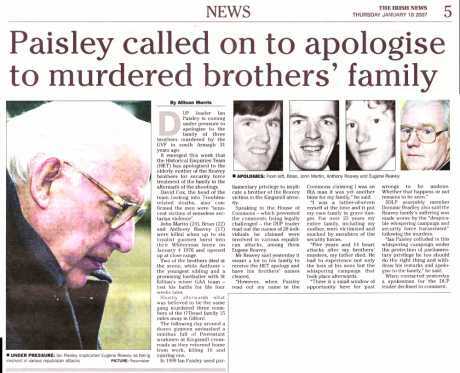 Paisley did not refer to the fact that Eugene Reavey lost his three brothers the day before the Kingsmill attack, or to the three O'Dowd killings. The thought may not have crossed his narrow mind. 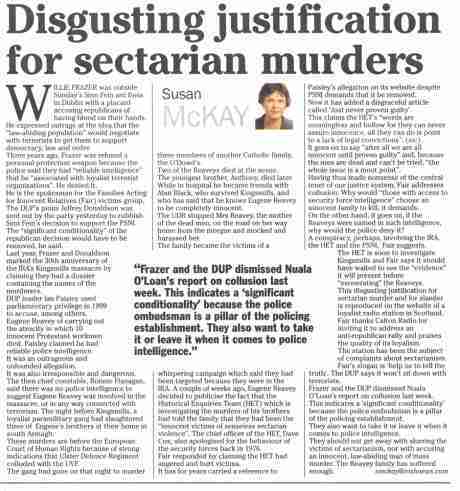 As well as being asked to apologise to Eugene Reavey - see Irish News article, click on article to read it - and his family, perhaps Paisley should also be asked who in the RUC gave him his information. Maybe he is obliged to respect confidentially. If so, he is respecting the confidentiality of liars and quite possibly of sectarian killers. "There is not the slightest chance of an apology being offered" (The Guardian, February 12, 1999, Terror of farmer named by Paisley as IRA killer). Will the Ian senior change his sectarian tune now, or will Hell first freeze over? I have two children, aged 7 and 4. What would I suggest they do in a situation like this? If you find out something you said about someone wasn't true, you apologise. If you hurt someone's feelings, you apologise. It is unlikely Paisley will apologise in this instance. He might then have to apologise to the families of the victims of the loyalists who stated publicly that it was the words of Paisley which prompted them to join loyalist paramilitary groups. He might have to apologise to the family of the woman murdered on the Shankill by a mob reputedly fired up by Paisley verbally targeting Catholic families who lived in the area. The author of the book who reported this is still waiting to be sued. He might have to apologise to the families of Sinn Fein members murdered by loyalist death squads who used sledgehammers to break into their homes shortly after Paisley appeared at a 'Smash Sinn Fein ' show of bravado with a sledgehammer prominent on the table he sat at. Just another chance for Dr No to utter his infamous "Never Never Never" line. The leader of the Democratic Unionist Party, formerly the Protestant Unionist Party, has reacted to the revelation that the Royal Ulster Constabulary organised the slaughter of his Roman Catholic fellow citizens by demanding that the criticism should stop. 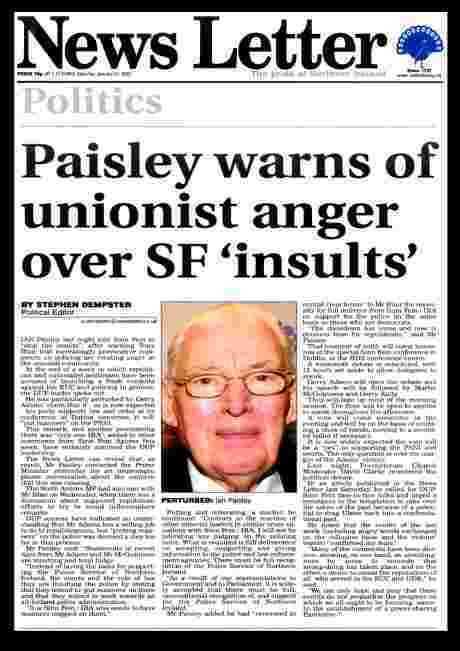 In the Belfast Newsletter on Saturday January 26 2007 Paisley is reported as demanding that Sinn Fein “stop the insults” directed at the killers in the RUC. In a sexist reactionary diatribe in the same paper Ian Paisley Jnr proclaims the RUC as paragons of virtue. He asserts that because no RUC officer has been charged and convicted of a crime, it proves how perfect they were. In fact it proves how corrupt the police and judicial system is in the sectarian state of Northern Ireland. This is not clear in the childish logic adopted by Paisley Jnr. In any case Paisley Jnr is wrong. Billy McCaughey, formerly of the B Specials, the paisleyite Ulster Protestant Volunteers, and of the RUC in South Armagh, was convicted of involvement in sectarian killings. So was RUC Special Patrol Group member John Weir. Both McCaughey and Weir later spilled the beans about the killing of the Reaveys and others in South Armagh. McCaughey was present at the slaughter of the three Reavey brothers on January 4 1976, and also presumably at the killing of three members of the O’Dowd family 30 minutes later. At this time, in confidential British government documents, there was concern expressed about the amount of collusion between the UDR and RUC with the UVF, and that these same forces were passing information to Ian Paisley. Of course, another section of the British military establishment was in the middle of attempting to create a sectarian war and was using these self-same forces for this purpose. Rev. Ian Paisley: I put it on record in the House that people on both sides of the divide make complaints against the Royal Ulster Constabulary. I should not like hon. Members to think that only the nationalists and the republicans make complaints against the police--Unionists also make similar complaints. …. Let the House not think that all the Unionists are silent and that they are quite happy, because they are not. Hon. Members should know that people on both sides are not happy about the actions of some police officers. Mr. Peter Robinson (Belfast, East): Will my hon. Friend confirm that one of the cases of great injustice in Northern Ireland--that of the Ulster Defence Regiment Four--has its roots in what occurred at Castlereagh holding centre? Rev. Ian Paisley: That is an absolute fact, which cannot be denied. I worry a great deal about the statement made by the hon. Member for Fermanagh and South Tyrone (Mr. Maginnis), who said that the police should not be inhibited in performing their duties. Is a police officer inhibited if he knows that his actions in an interview chamber are being recorded by silent video? I do not believe that he is. I know people who have been dragged before the police at Castlereagh and the first question they are asked is, "Do you attend Mr. Paisley's church?" ….. It is reasonable to comply with the Government's suggestion today. We are striking a balance and the House should realise that, in so doing, it is not indicting the RUC entirely. I have always defended the RUC as a police force and a police service. I have also defended the Ulster Special Constabulary [the ‘B Specials’] in this place. My first speech in its defence in the House caused the blood pressure of some hon. Members who sit on the Opposition Benches to rise. In my day, I have picked up many newspapers and read how so and so was abused, kicked and compelled to make a statement while in Castlereagh. People were told that, if they did not make a statement, they would be the worse for it. Paisley ally Willie Frazer slanders Eugene Reavey again! 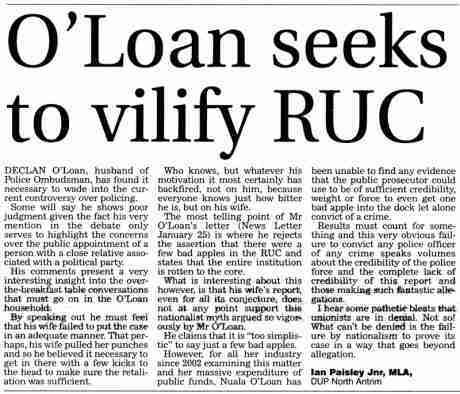 Willie Frazer has responded to the PSNI Historical Enquiries Team vindication of Eugene Reavey by trying to smear him again - see Susan McKay article, Irish News January 30 2007. This defender of security force collusion with sectarian killers, who claims that dead UVF-UDR members are “innocent” victims of the troubles, has a visceral hatred of sharing power with republicans. So much so, he joined up (inadvertently) with RSF in protest against Sinn Fein last Sunday at the RDS – see picture. "RUC men's secret war with the IRA"
Some background to Collusion between the British Army, RUC, UDR and the UVF in Sth Armagh. Six feet tall and built like a brick outhouse, John Weir stood out, even at the shot put competition on RUC sports day. The two officers had no difficulty picking him out that day - June 23, 1976 - at the RUC sports grounds in east Belfast. They were from an elite anti-terrorist unit called the Special Patrol Group. Although only 26, Weir had already served with the unit in Armagh and knew some of the men. He was also familiar with their message. The IRA was winning the war, they said. It was time to throw away the RUC rule book. Weir still remembers their exact words. "They said they were fed up with the way things were going and had decided that if they were not allowed to do their job, they would do it outside the police force." The officers took Weir fully into their confidence. They had already attempted mass murder, they intimated. "They had carried out a shooting on the border at the Rock bar, in Keady (south Armagh). They had shot it up and left a bomb," said Weir. "And that was just the beginning. They intended to take the war to the IRA." Weir was easily seduced by the talk of direct action, of pre-emptive strikes against the nationalist community, of frustration with the RUC's "softly, softly" approach to terrorism. Like many Protestants, Weir had been deeply affected by the Kingsmill massacre earlier that year, 1976, when 10 Protestant workmen were forced from a bus and murdered. The killings were claimed by the South Armagh Republican Action Force. Weir and the Special Patrol Group knew that was a cover name for the IRA. The suspects were still at large. Weir and others in the RUC feared they would strike again. The unit would not stand idly by. TALL, blond, blue-eyed, John Oliver Weir still looks like an Aryan hard man from a Holly wood film, but the convicted murderer sinks into troubled thoughtfulness as he breaks decades of silence about his bizarre career. Born in 1950, Weir was brought up on an estate near Castleblayney in Co Monaghan. His gamekeeper father was Unionist by inclination but happy to live in the republic, working for the local remnants of the Anglo-Irish aristocracy. Weir went to King's Hospital, a Protestant boarding school in Dublin, and then considered joining the gardai. Instead he chose the RUC, largely because of his family background. His first posting, in 1971, was to Strandtown, a mainly loyalist area of east Belfast. It was a potentially dangerous posting for a young man from the republic. The newly formed Ulster Defence Association, still legal, was organising vigilante patrols. The RUC, then less than 5,000 strong, was stretched. Morale was low, mainly because of reforms that disarmed the force and disbanded its auxiliary, the B Specials. The British government declared a firearms amnesty. Weir remembers how rogue RUC officers used it as a cover to arm terrorists. "People who were not involved in violence handed in old Sten guns, .303 rifles or handguns," he said. "The good ones were handed straight back out to the UDA. The rubbish was put in the armoury." Weir claims this distribution had the sanction of senior officers, but then admits that a colleague who helped the UDA was dismissed from the force for robbery. After two years in Belfast, Weir was assigned to the Special Patrol Group in Armagh, where officers "were very anti-republican, and sectarian attitudes were common". He and others routinely assaulted Catholics suspected of republican sympathies. The unit saw itself as being at war with the IRA and regarded loyalist paramilitaries as allies. Thus Weir and his comrades tipped off UDA and Ulster Volunteer Force suspects before their homes were raided. Eventually senior officers stopped telling the unit about loyalist arrests. The unit's behaviour was so provocative that it was restricted from patrolling republican areas such as Crossmaglen and Silverbridge. Frustrated, Weir and another officer, who is still serving, met Harold McCusker, the local Unionist MP. They gave him a map showing the areas that were out of bounds to them. 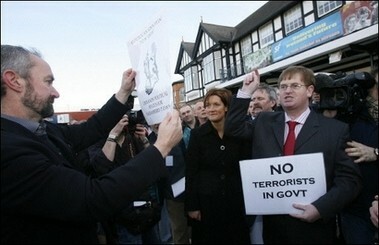 McCusker used it publicly to decry the "policy of appeasement". Some of the restrictions were then lifted. By late 1973, Weir said, a consensus had formed among his peers that they should break the rules to curb the terrorists. Billy McCaughey, an RUC constable in Lurgan, shared Weir's analysis. He expressed virulently anti-Catholic views to colleagues and made it known to friends that he had strong links to the UVF. McCaughey had been a member of the Ulster Protestant Volunteers, a Paisleyite paramilitary group, before he joined the RUC. A Special Branch recommendation that he be excluded after his probationary period was overridden by an inspector's report that described him as "one of the best, if not the best, con stables attached to my section (of the B Specials)". Weir, McCaughey and Gary Armstrong, a constable, became friends and drinking companions. Senior officers were suspicious of the trio. They were right to be. All three were destined to link up with the wild men of the loyalist paramiltaries. IN January 1975, Weir discovered that John Francis Green, a wanted IRA terrorist, was using a safe house just over the border, near Castleblaney. Weir told RUC colleagues in the Special Branch. Green was subsequently murdered there by the UVF. Shortly afterwards, Weir was told that his life was in danger from the IRA. He was moved to the relative safety of Castlereagh in east Belfast, a Protestant area. He said the real reason for the switch was that he was suspected of helping the killers. The transfer may have been intended as a signal to Weir that the authorities were watching him. It was also a signal to his extremist colleagues that he was "one of the lads". From Castlereagh, Weir travelled all over Belfast. He had access to vast amounts of intelligence material. He said he and his colleagues routinely passed details of IRA suspects to loyalists. It was then that Weir was approached at the sports day. "They told me there was already a group operating in south Armagh," he said. "The idea was for the whole lot to join up and try to do something about the situation. They had no name." A few days later, they met in Armstrong's house in Armagh. "They said they had connections with the UVF in Portadown, they were helping the UVF by giving out names," Weir recalled. "I don't know the specific case, but they said they had given out a name to set someone up and the UVF had shot him." Another policeman who attended the meeting at Armstrong's house said last week that the group discussed setting up its own UVF unit, but that none of the officers formally joined the terrorists. There was no need. There were later meetings at the home of a police reservist near Markethill in Armagh. He was later thrown out of the force after it emerged that he knew of the plot to bomb the Rock bar and had been caught in possession of home-made machineguns. Now in his eighties, the reservist said he knew Weir and some of the others, but denied any wrongdoing. The weapons must have been hidden in his outhouses by a previous owner, he said. According to Weir, the Markethill farm was a regular meeting place for the UVF and its police or Ulster Defence Regiment allies. His new comrades told Weir that members of the army and UDR were responsible for the Dublin and Monaghan bombings of May 1974, in which 33 people died. Weir claims the operation was organised by Billy Hanna ( see below ). The cars used - one from Portadown, one from Belfast - allegedly stopped at the reservist's house for the explosives. They were supplied by a businessman who was a part-time officer in the UDR's intelligence section. Weir said the civilian casualties in Dublin were deliberate and there was little effort by the RUC to hunt the killers. "There were RUC members who would have solved the case if they had a chance," he said. An attack on Donnelly's bar at Silverbridge in December 1975, in which three people were killed. The massacre of three members of the Reavey family on January 4, 1976, in Greyhillan. A non-fatal bomb attack on Tully's bar in Whitecross, on May 7, 1976. Weir is adamant that policemen, UDR soldiers and members of the British Army were involved in these crimes, and that they had the unofficial imprimatur of senior RUC men. Was this true? Probably not. Because if there were, Weir would still be serving in the Northern Ireland police force. WEIR'S first operation was to help two UVF men and a police officer bomb Renaghan's bar in Clontibret, Co Monaghan. They chose August 15, the day of a nationalist parade in the village. Weir travelled down to check the road for the bomb car. To his surprise, the Irish army and gardai had blocked off the village. When he showed his RUC warrant card they told him they were expecting a car bomb. Weir returned to the farmhouse and found it under army observation. It transpired that the plot had been blown after a UVF man from Moy in Co Tyrone was arrested and talked under interrogation. A debate followed on what to do with the bomb, now sitting in a car in a garage. Armstrong wanted to move it to Culloville in south Armagh. The UVF, owner of the device, insisted on bringing it to Keady, where it was detonated outside the Step Inn, killing two Catholics. Weir said the army should have seen the car being moved. Years later, Weir said he was told that he had been photographed at the farmhouse. After the Keady murders, he was promoted to sergeant and transferred to Newry. There, he took part in a plot to sell home-made machineguns, manufactured in Castlewellan by a group called Down Orange Welfare. Weir picked them up from a police officer in Newry and passed them to the UVF through the Markethill police reservist. He said that on one occasion he picked up a gun at the home of Harry Breen, then a uniformed chief inspector but later a Special Branch superintendent. Breen was murdered by the IRA as he travelled home after an intelligence briefing with gardai in Dundalk in 1989. "A friend of Breen told me he could get imitation Sterling sub-machineguns with genuine carbon steel blocks if I was interested," Weir said. "He wanted money for them to go back to Down Orange Welfare because they were developing an M1 carbine." 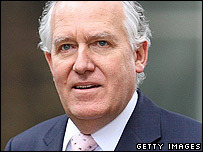 Weir's confidence that there was high-level backing for his actions was dented at times. He once outlined a plan to his subdivisional commander in which armoured lorries would be driven into IRA roadblocks. The senior officer told him he was a madman. Weir was introduced to Robin Jackson ( see below ) by Armstrong. "Jackson, Armstrong and I scouted the roads down through Crossmaglen. We showed him where IRA men lived. Jackson was interested in setting something up around Newry, but nothing ever came of that." In April 1977 Weir and McCaughey took Jackson and R J Kerr, another UVF killer, to Ahoghill. There, Jackson shot dead William Strathearn, a grocer. McCaughey said: "We thought he had hidden guns used by IRA men in a recent attack. We wanted to send them a message." Their information was false. It had come from another corrupt police officer. Strathearn was entirely inno cent. His death caused widespread revulsion and ultimately led to Weir's downfall. By now, Weir's extensive contacts with loyalists were known to senior officers. He was summoned by Brian Fitzsimmons, then a Special Branch inspector and later assistant chief constable and head of anti-terrorist activities. "He told me he knew I had connections out there," Weir said. "That was why he wanted me to go out, make more connections, find out what was going on. He also made it quite clear that the Special Branch was keeping an eye on me." Weir took this as encouragement to collude with loyalists, but it seems more likely to have been partly a warning, partly a bid for control of his informant. Fitzsimmons placed Weir under surveillance and allotted two officers to "befriend" him in an attempt to find out what his "connections" amounted to and who his sources were. Weir claimed that one of these two officers told him he approved of what the corrupt RUC man was doing. Weir was also told that he was suspected of the murder of Strathearn. His loyalist links were now widely suspected. People suggested that he take part in attacks, but he could not be sure whether they were genuine or attempting to trap him. One army intelligence officer asked to be taken to loyalist meetings. He and an RUC inspector also asked Weir and another sergeant to plant guns on Donal Walsh from Belleek in south Armagh. At first, Weir liked the idea but later he worried. "I said to the other sergeant, 'What happens if these people catch us with guns? Supposing they know that both of us are already a little bit involved in other things and maybe they just want rid of us here and they'll shoot us'." Another army officer suggested to Weir that he should get a group of loyalists to kill Thomas "Slab" Murphy, the IRA leader, and his family. Again, Weir consulted his two Special Branch "friends" who advised against it, telling him "that I would be very stupid to do that because what would stop the army from shooting us, and that would stop the whole thing". On another occasion Weir told the Special Branch men that he intended going to the Spinning Wheel bar in Castleblayney to kidnap Dessie O'Hare, the republican terrorist later known as the Border Fox, and they encouraged him. However, when Weir and Jackson arrived in Castleblayney, they found the publican had been tipped off and they were told to get out. Next day the gardai phoned the divisional commander in Newry and made a complaint. This was probably the first evidence Fitzsimmons's team had that Weir was prepared to operate with Jackson to break the law. They decided to close him down. They warned Weir that he was about to be shot by republicans and told him he would be moved somewhere nice and quiet. It turned out to be Dunmurry, a middle-class Protestant area on the outskirts of Belfast where there was little scope for collusion. By now the net was closing on Weir and the other 14 or so RUC officers colluding with the UVF. Special Branch in Armagh had become aware of a plot to kill a senior officer in order to prevent arrests. Weir, alone of the three members of the group interviewed for this article, seemed to have believed he had outside protection and approval. McCaughey said: "I knew I had no backing. If I had backing, I would have done far more. I was worried sick about being caught. I knew I would be jailed and I was drinking very heavily through stress." McCaughey signed himself into a mental home in an effort to escape the investigation. After they were arrested for the Strathearn murder, both McCaughey and Weir started to talk under interrogation. Weir offered to turn Queen's evidence against Jackson in return for immunity. He was offered a deal whereby he would have his sentence reviewed after five years, but would still be prosecuted and have no guarantee of early release. He turned this down and ended up serving 14 years in prison, but maintained to this day that the fact that Jackson was not prosecuted is evidence that the loyalist terrorist was being protected by senior officers. Chief Superintendent Eric Anderson, deputy head of CID, saw it differently. After reviewing the police files on Weir, he said: "Kerr and Jackson were not charged because there was no evidence against them at that time. Weir had offered to give evidence if he was not himself prosecuted but the director of public prosecutions would not allow that to happen." Anderson pointed out that there would have been widespread protests if a policeman had been let off with his part in murdering a Catholic, in return for giving evidence against a civilian. Anderson interrogated Jackson about other offences. Without evidence, Anderson believed, there was no point in interviewing Jackson about the murder - he would simply keep quiet. After examining a dossier of Weir's accusations against other officers, an RUC spokesman said last week that the allegations were fully examined at the time. All the files of the period were re-examined, shortly after Weir's conviction, by Anderson, Kevin Sheehy and Frank Murray, another senior detective. McCaughey's view was that there were about 16 officers colluding with loyalist paramilitaries. "All but two were arrested and most were charged," he said. "They were low-level people." Weir insisted he was telling the truth. "Some day it will come out that there were people high up, either Special Branch or army intelligence, who were using us," he said. "They were not getting their hands dirty. The army, I believe, was using people to do dirty work along the line." 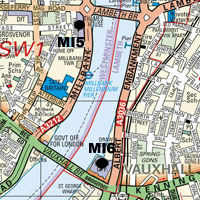 It is unknown at the moment whether Liam Clarke is an Mi5 Agent or a Dummy or Both.He has lost his job as the Northern Ireland[Ulster] Editor for Sunday Times as the Times is closing down its Northern Ireland Operation.He works for Rupert Murdoch the owner of the Times Newspaper.As well as his journalism work for the Times he is involved in a Vendetta against Gerry Adams and Martin McGuiness.As well as writing for the Times Newspaper he publishes his Vendetta Material at Cryptome.org, Indymedia, Wikpedia, Blogger.com and numerous other online publications including The Times.He is working closely with Martin Ingram Aka Ian Hurst and other persons unknown.Some of the Vendetta material is published in his own name but some of it is anonymous as you will see in these two links from wikiscanner.virgil.gr where he is updating these two web pages. Mary Benson was born on 8 December 1919 in Pretoria, South Africa and was educated there and in Great Britain. Before the Second World War she was a secretary in the High Commission Territories Office of the British High Commission in South Africa. Between 1941-1945 she joined the South African women's army, rising to the rank of Captain and serving as Personal Assistant to various British generals in Egypt and Italy.After the war she joined UNRRA and then became personal assistant to the film director David Lean. In 1950 she became secretary to Michael Scott and first became involved in the field of race relations. In 1951 she became secretary to Tshekedi Khama, and in 1952, together with Scott and David Astor, she helped to found the Africa Bureau in London. She was its secretary until 1957 and travelled widely on its behalf. In 1957 she became secretary to the Treason Trials Defence Fund in Johannesburg. She became a close friend of Nelson Mandela, and assisted with smuggling him out of South Africa in 1962. In February 1966 she was served with a banning order under the Suppression of Communism Act and she left South Africa for London later that year.In London she continued to work tirelessly against apartheid, writing to newspapers and corresponding with fellow activists in South Africa. In April 1999 Mandela visited her at her home during his state visit to Britain and later that year an 80th birthday party was staged for her at South Africa House.Mary Benson died on 20 June 2000.Among her writings are South Africa: the Struggle for a Birthright, Chief Albert Luthuli, The History of Robben Island, Nelson Mandela: the Man and the Movement, the autobiographical A Far Cry and radio plays on Mandela and the Rivonia trial. This is sectarian biased journalism at its worst. Ian Paisley is a man of God and it is articles like this one that keep the divide in our country wide open. are you haveing a laugh . ian paisley is a proformer and you are his audiance . since when does a man of god preach about hatred . since when does a man of god abuse a pope one of the close's men to god who devoted his life to god who loved paisley the way god taught him to love your enemies. i take it you were haveing a laugh. thank god paisley is out of irish politics . now we can move on without him.